Why is my poop pink in colour? What is poop made up of? From where do birds and snakes poop? What happens to poop after we poop? My twin daughters have a number of enlightened discussions with me and one of them revolves around poop. I understand that the curiosity of a child must be fulfilled. One of my daughters’ favourite subjects is poop and I try to ensure that I answer all their questions, – to the best of my googling capabilities. As they are twins, we have twice the number of occasions to delve into the fascinating world of poop and pee. The girls know that poop is made up of 75% water and that their pee is made up of 95% water. With the help of Google, they have been introduced to the rest of the constituents also. They have been very keen to know how poop gets made. So, they have seen Youtube videos of small and large intestines and all that happens along the way. We have a pet love-bird and a pet fish at home. At times, the girls stare them down for a considerable amount of time to check out how they poop. They don’t want to miss any action. Of course, they are learning to be patient and observe. But I do strongly feel the pressing need for teaching them to respect the privacy of everybody around. Whenever they have beetroot, they eagerly look forward to their poop the next day. They are extremely fascinated by the fact that eating beetroots lends a pink hue to their poop. The girls’ overbearing excitement at meal times and their colourful anticipation of the next day’s output make it nauseating enough for their mother to let go of her meal. And I have to take the blame for her going empty stomach. Some reward for encouraging a child’s inquisitiveness. The girls have learnt the Finger Family Nursery Rhyme and somehow they have connected it with their poop. So, when they poop, basis the size, they identify them as members of the poop family – Papa Poop, Amma Poop, Brother Poop, Sister Poop and Baby Poop. And when the quantity is less, they sadly announce that their Poop Family has remained incomplete. Imagine there could even be such a practical way of teaching nursery rhymes! The girls have been on Iron supplements on and off. During these episodes, their poop is black and hard. They get enthralled by the black poop and its hard texture, as they see it as a welcome change from their routine daily output. If they don’t poop for a day or if their pee is yellow, they know the course to be followed – eat bananas and drink lots of water. The minute they realise that either of us is in the washroom, they stand and start asking us as to what we are up to, how is it going, how much did we poop – a repeat of all that we tell them when they are into poop. So, yes, it feels great that they understand every bit of it but the role-playing at times just goes too far!!! The girls love their poop and we are fond of discussing it, as and when they feel like. And this happens very often. Nothing gross at all – it is all about good health and my daughters will vouch for that. We are a three member potty club, open for memberships. When the girls were around two and a half years old, not sufficiently potty-trained and still in diapers, we had gone to a children’s playhouse. The care-taker noticed some poop on the play-mat and asked me to clean it. I have been cleaning the poop of my daughters and knew that what was on the floor was not theirs. I asked my daughters about the poop – both said that they did not do and their diapers were also empty. The owner of the play-house lectured me on putting diapers properly and asked me to act responsibly. Anyways, I cursed my luck and cleaned up the potty. After coming out of the washroom, I saw a 7-8-year-old boy standing outside, wearing a night-suit and there was potty below his pyjamas. Realizing that the boy was doing potty standing outside and what I cleaned had an eerie similarity to what that boy was doing, I asked the boy about the place of his earlier relief and he showed me the place where I had cleaned up. I called the owner, showed him what was down and the boy. No apologies whatsoever, he just walked off to call the father of the boy. I had no interest in whatever happened further. I left with my daughters, never to return to the play-house again. Author connectPosted on May 30, 2018 September 18, 2018 Categories As A ParentTags Parenting, Poop, Stay At Home DadLeave a comment on Why is my poop pink in colour? In the first part of 10 must-do activities of stay-at-home-dad, I mentioned about cleaning the poop, potty training, feeding and putting to sleep – the basics. Here goes the second part of 10 must-do activities of stay-at-home-dad. Tidy Up: The girls haven’t still gotten the hang of tidying up the mess that they create every day. They like to play with everything they can lay their hands on and that’s about it. They do not care much about returning the stuff to their respective places. So, after they sleep, I have to pick up the pieces of the day and put them back so that the girls can start afresh the next day. I am gently and at times vehemently being pushed by the wife to get the girls into this habit. So hopefully, sometime soon. Grocery, vegetable shopping: A task that has to be done with the girls in tow. In the hypermarket, both of them want independent trolleys and even if they sat in one, there would not be any place left. So, we end up providing ample entertainment to fellow shoppers as I try to navigate the two trolleys in the busy aisles, trying to pick up stuff from the shelves and explaining to the girls what it is all about. In the road-side markets, it is even more difficult. To navigate the traffic and the dogs, bargain with the vendors and make payments and hold the stuff and the girls. So far we have struggled and survived. Giving bath: As I show no inclination for the girls’ breakfast, their mother feeds them whenever she is at home, but it also means that she never has the time to give them their bath. So, 30-40 minutes spent daily to convince them to come inside the bath, clean them up and again convince them to come outside the bath. It is also the time that we have un-disturbed peaceful conversations about many a topic that get left out in the rush time of play hours. I hardly have an appreciation of colours and designs. So when it comes to dressing them up, I have worked out the easy way. The girls get to choose what they want to wear depending on whether we are staying at home or going out. I only help them don their respective stuff as they are yet to do this task independently. Waking up in the night: This is again one task, which I took on once the girls were born. Throughout the day putting up with them, my wife and my parents/in-laws (whoever available) would be dead-tired by the night and I would come back energized from my office. Whenever there was a requirement – they were ill, they over-slept in the day, they were plain cranky, I could do the night-out with the girls. And this aspect remains with me, even now. Staying away from the internet: I have never owned a smart-phone, but do have an I-pad at home. I have realized that if I want some peace around, it is better to have my eyes and mind on the girls than wandering on the internet. Even when India is playing a cricket match or election results are getting declared – whatever. I am glad that I was never hooked to Whatsapp and Facebook. Putting up with tantrums: The list, of course, would not be complete without putting up with the tantrums. A day going on just fine, and one melt-down and it makes a complete mess out of everything. I have realized that I can do as much as I can to prevent but if it has to happen, it will happen. All in a day’s work. To be honest, these are the tasks that their mother once did when I used to go to the office. And now that she does and I am at home, I do these tasks. Just that, she was not asked, as often, and I do get asked, almost all the times, on what I am up to for the whole day. Believe me, spend 24 hours, even 12 hours with three and a half year old, single-handedly, and it will be an eye-opener on the work done by the mother in the upbringing of the child, along with all the household chores. Though meant for stay-at-home-dads, fathers who have full-time jobs can also always pitch in and do the above-mentioned tasks whilst they are at home to experience the uncensored joys/bliss of hands-on parenting. None of these is earth shattering and mind you, there is no MOM science in any of these. What are the activities on your list? What do you do for the whole day? Don’t you get bored? Don’t you feel like getting back to your corporate job? As a stay-at-home-dad, I am often asked these questions. 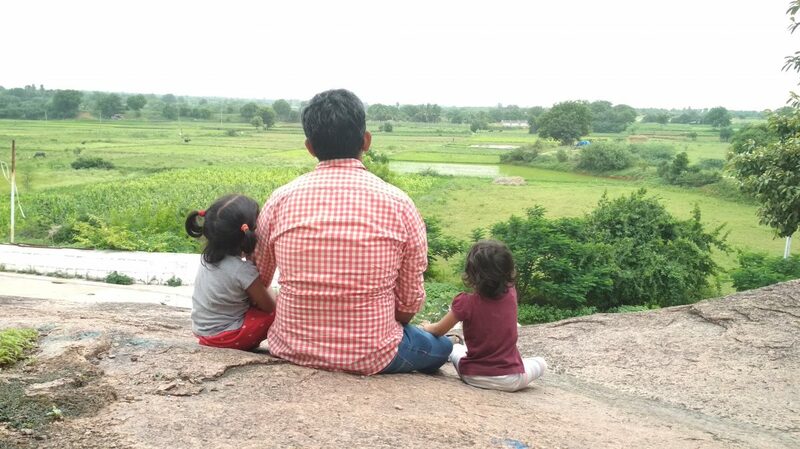 My wife did not have to face such probes when she left her full-time vocation to be with our daughters for the first 2.5 years of their life. I suppose mothers are not asked such questions at every occasion. Let me give you a peek into my day, what all I do on a daily basis with my daughters. (Though these are named as must-do activities of a stay-at-home-dad, all types of fathers can do all these activities. There is nothing earth-shattering, no rocket science in any of these). Cleaning the poop: Since the birth of my daughters, I have been doing this; so nothing new as such as a stay-at-home-dad. I realized soon enough that my wife is busy nursing the girls and if there is one task wherein I can be of any help to her is to clean the potty of the girls. As on date, the girls associate this task with me so much that whenever they have to go potty, they come to me and not to their mother. Needless to say, I am very proud of this achievement. In fact, I have become quite an expert in understanding my daughters’ health based on the colour, texture and frequency of their potty, having discussed potty issues with the paediatrician a number of times. After the initial days, the guilt of contributing heavily to environmental degradation encouraged me to do the clean-up with my bare hands. No wet wipes, no tissues, no newspapers, and no other aids. I have so much to say on this subject, I might as well write a separate blog on this. Cleaning the vomits, cleaning up after bedwetting episodes – all of these also belong to the same genre, and for small babies, there is quite a bit of this and I am always available for operation clean-up. Potty training: I spend the maximum time with the girls during the day. Hence, it is but natural that I have the onus of potty training them. I keenly watch their water intake and food and keep reminding them about the need to go to the washroom. To be honest, it is much easier to clean up inside than anywhere else in the house. So better to keep reminding them rather than forgetting and then spending 10-15 minutes on the clean-up. The girls have age appropriate potty training and I should share due credit with them for this achievement. Feeding: This is a task that I shy away from as much as I can. I am highly enthusiastic about all the tasks listed here, but not this one. Both the girls are finicky – one with the quantity and the other with the variety, enough to drive both of us crazy. When my wife is in town, I feed them only lunch. When she is travelling, I feed them all meals; otherwise, I pass on the buck to her. A good meal means some peace around for at least a couple of hours. After a while, the girls will again get hungry and then, the running behind them to feed will have to start again so that they can continue their running around. And this cycle just goes on and on. Putting the girls to sleep: This is another task of paramount importance without which a stay-at-home-dad cannot survive. When I was working, girls had the habit of sleeping with their mother in the afternoon and with both of us in the night. In the current scenario, my wife is not available for their afternoon nap and at times, for their night sleeps as well. Fortunately, the girls have had a peaceful transition in terms of letting me put them to sleep on all occasions. So, some peace prevails. This is the first part of the blog, the second part coming soon with the remaining activities. In almost all the social conversations, we get asked about our twin daughters – their well-being and the regular stuff. We reply with whatever the general status, as on date. So far, so good. The issue started propping up for me whenever the queries were a bit more than general, which needed to be answered in specifics. I somehow was getting uncomfortable with these pointed questions. It was not about the need to hide anything about the girls, or about the questions in particular or the persons raising it. I was feeling awkward about my choice of words to answer the questions. As a reply to the question I go on and on, rather than answering in a single word and describe the entire process when the person is actually interested in only knowing the output. I answer in various scenarios and not the occurrence of a single incident. I try to ensure that nothing – behaviour, action, mannerism etc get branded to either of the girls. Something like what I am writing in this paragraph. I realized that I am uneasy about using adjectives for my daughters. I am not so sure about my approach to being anxious about using adjectives, be it either in the presence or even absence of my daughters. For me, using adjectives amount to labelling/branding of the child. The child is just growing up, there is no way to know if the current trait is going to continue or a new attribute is going to pop up at any point of time, why to put the child in the shackle of a word? I feel that putting the word for a child becomes a self-fulfilling prophecy. The child understands the meaning of the word, what it means and tries to come true to it. There can also be a contrary view that once the child understands the word, the child might show opposing behaviour. Or actually, nothing happens. It is also something like the person asking the question expects the answer to be in a word – specific. Something like, till the time we are unable to bracket the child we get restless. Something like, we are averse to free-spirited individuals and it extends to the child too. We would not want to explore the unknown, and hence better to put a tag on the child. I have noted that whenever the adjectives get used for any of the girls, the listener tends to remember better than the whole verbose long-winded reply given by me. And the next time, the girl gets referred to by that very word, easy to remember – the label. And to add to my irritation, the person in the spotlight will call the girl using that very adjective, which I have kept her away from. I feel that it becomes a tad easier for the child too to refer to each other if they have a specific word on hand for the other children in the group – to name them, to call them by that word, it sticks and becomes simplistic. It also becomes like the child starts referring to herself/himself by the adjectives used for her/him. Or maybe nothing of the above happens. It is just that I am being paranoid and trying to be too much of a nit-picker. It is not like I am not going to teach them adjectives. They will be taught but currently, I see no hurry, as such. What would be your take on this subject?